Directed by Alejandro G.Inarritu, Starring Leonardo DiCaprio, Tom Hardy, Domnhall Gleeson, Will Poulter, Forrest Goodluck. A fur trading expedition in the 1820s goes horribly wrong, Glass (DiCpario) is then left for dead after being mauled by a bear and is forced to survive in the bleakest conditions. Though Alejandro G.Inarritu has made several shorts and documentaries, this is his second feature film, the first being the Oscar winning film Birdman. I was never overly enthused by Birdman as although the filmmaking was exceptional, the narrative became either far too introspective which became dull after a while and the narrative simply ceased to interest me half way through the film. I felt too that the film, perhaps too critically, was an example of style over substance. 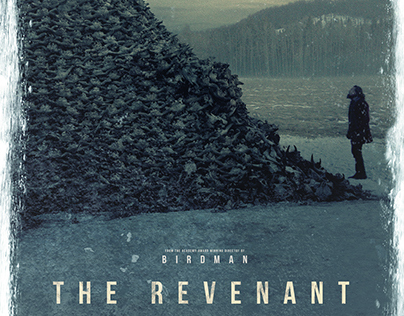 The narrative structure in Revenant is very simple, without wishing to spoil the narrative, the Revenant is simply a revenge film which seems to play to G.Inarritu’s strength as a filmmaker. This is evidenced throughout Revenant as his intelligent filmmaking abilities combined with his use of the surrounding environments culminates into a marvellous exploration of the raw inner conflict of man and nature. His use of this natural enviroment is utterly superb. I have watched and read many an interview with the cast, all of whom depict scenes of freezing conditions harrowing experiences and often difficult working conditions whilst making this film, I can now quite believe it. What I found particularly remarkable whilst watching this film, is that although it must have the budget of a Blockbuster film, it’s style and technique has more in common with an independent film. There are no moments of frustration where a character delivers an overly long speech at the exact wrong moment, or the hero is seen skillfully defending himself against 5 native Americans. Nor more importantly are any of that quite handsome cast made to look aesthetically pleasing. This film is utterly raw and never restrains itself from its exploration of the brutality of men. While this film is not going to be universally enjoyed owing to some of the more violent and gruesome scenes. I highly recommend to those who do to buy and display this on the highest picture quality you can find with the clearest sound. This is an experience, one that showcases of the director’s true filmmaking ability and the casts steely determination. Though some have commented on DiCaprio’s lack of speech, an unfair assessment, in my opinion, his performance is certainly Oscar worthy. Hardly surprising given his performances since Django Unchained are each Oscar worthy contenders. The only reason I can fathom why this performance gave him that edge required to finally win that elusive achievement, is owing to the raw brutality and emotional exposure DiCaprio portrays. Finally, one of the more popularly known and discussed scenes from the film is one that pits DiCaprio against a bear. I may have to watch this scene repeatedly until I have a better understanding of how this was accomplished, it is brutal, layered and not one moment of even slightly suspect CGI used. Indeed, that last sentence may well describe the majority of the film. ***** Utterly marvellous film-making, a simple narrative it may have, but by placing the film in this location, you experience a raw many layered film, which if it appeals to you will be a phenomenal experience. RECOMMENDATION – If your thing is a good survivalist story or if you are a fan of any of the actors involved I cannot recommend it enough.